What is the Lowrance Hook 7 Best For? The Hook 7 is an all-in-one featured fish finder and GPS unit made by one of the more recognizable names in the industry, Lowrance. This unit features the best tech from Lowrance fish finder units and combines them into one useful, user-friendly package for any fisherman out on the water. Best of all it comes in at an attractive price, making it a great value. These essential features built into the Hook 7 maximize each moment you spend on the water whether on woodsy creeks, lakes, or when fishing offshore. If you are looking to step up and combine electronics for whatever watercraft you may have, take a closer look at this unit. Designed to be an all-in-one electronic unit for your watercraft, the Hook 7 by Lowrance delivers a bundle of great features sought out by anglers. The vibrant 7-inch display is a great size compromise to make it fit seamlessly on a wide variety of watercraft. The affordable unit is complete with the coveted CHIRP Sonar and DownScan technology to provide you with a crisp and total view of the water underneath your feet. Additionally, with the Hybrid Dual imaging technology, you have the option of overlaying the two sonar systems onto one screen to get the best of both worlds, allowing you to view the water below you in an optimal way. Users also have the option of a multi-window display which allows for up to three different viewing screens. An example could be one screen for Downscan, another for CHIRP sonar, and the third for GPS navigation. The Hook-7 features enhanced sonar sensitivity and excellent target separation to aid in identifying fish targets, structures, cover, depth, and bottom composition. With built-in GPS features, marking and returning to favorite fishing spots and travel paths is a simple task. The Integrated 16-Channel GPS provides users with a fully-functioning GPS unit built into their fish finder. With this feature comes the ability to lay down waypoints and tracks to mark important spots and see where you have been. The unit is also compatible with the Insight Genesis map. This allows you to link maps on your fish finder GPS and smartphone. You can modify and upload maps from your smartphone onto your unit. With the integrated Basemap charts, you can also have a good visual idea of where you are on the included maps, which can also be upgraded. Basemap charts are included in this unit. While this isn’t a full-fledged, high-resolution topographic map system, it provides you with a variety of fairly navigable maps and provides you with maps to indicate your approximate location. It will set your mind at ease to know you will have at least a basic map wherever you may go. However, upgrading to higher definition maps is recommended if you are relying on the unit for navigation. 2D Chirp and Downscan technology gives anglers multiple high definition viewing options of the water column below them. The transom mount transducer can relay images to the screen on either or both viewing technologies. The 2D Chirp setting is touted as being one of the best for picking out fish with excellent separation and can read more than a depth of 1,000 feet below. The Downscan setting allows for photo-like clarity of structure and benthic features below the boat. The Downscan doesn’t quite have the fish reading ability of the Chirp technology but offers good object clarity down to 300 feet. Thankfully this unit has both. Hybrid Dual Imaging allows the user to view a combination image of CHIRP and Downscan technologies to get the best of both worlds in one image. The unit also offers a split-screen option for up to three different simultaneous viewing windows, giving the user tons of input in one quick glance of the unit. Basemap charts though nice to have, providing a wide variety of maps, don’t offer the extreme detail some users may ask for. These included maps offer minimal detail in the form of precise navigation by GPS and accurate viewing maps. For some anglers, they may need to upgrade to higher definition maps for some of their more regular fishing areas. Unit speed and refresh times are reported by some users to be slow and lagging at times. They report delays in some of the unit's functions and a difficulty providing proper GPS positions at higher boat speeds. 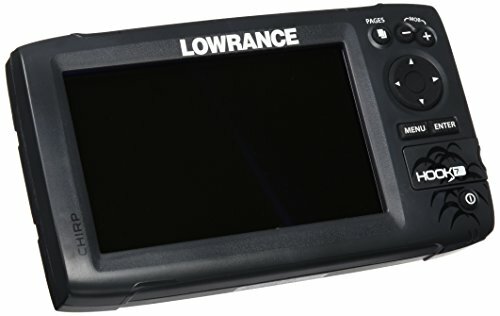 This Lowrance unit is geared toward someone looking for an all-purpose electronic unit to hard-wire onto their fishing boat. With a full-featured GPS, CHIRP, and Dowscan technology, this can be an all-in-one electronic unit for your fishing boat. While the unit comes complete with fully-downloaded Basemaps, they may not be ideal if you depend on the GPS for navigation. Some users report limited precision with the standard maps. For those needing to depend on the GPS navigation, you may be best off downloading additional, higher resolution maps. With both Downscan and CHIRP sonar, it gives users the ability to clearly see a lot of features underwater. The unit is also capable of over-laying the two images or splitting them across three separate displays on the screen. For those interested in syncing their boat electronics with their smartphone, the Genesis Insight app allows such. This allows you to download and modify maps on your phone and then transfer them to your GPS unit. At a nice, compact, yet easy to see size, this could be a great unit for just about any boat, even a small little Jon boat, canoe, or v-hull. This unit gives users high-quality watercraft electronics at an attractive price. The bottom line is this unit is full of features at a very affordable price for most anglers. Instead of having multiple electronic units on your boat each with different jobs, why not combine it all into one unit? With the Hook 7 by Lowrance, you have a full-featured fish finder, bottom surface scanner, and GPS in one compact two-pound unit. With this unit, you have the best of both worlds in viewing both fish and underwater structure with excellent compromise in precision and display. If you are looking for your first boat electronics unit or just looking to consolidate your electronics into one versatile unit, the Hook 7 has proven itself to be a good value for the price.